With such diverse products from many different product designers, I wanted the final Wood Look brand to be capable of supporting a range of visual styles. With an open color palette and structured "series" branding for each designer, it allows each designer to have their own voice within the Wood Look brand. For this class project, we were assigned businesses to rebrand. Wood Look is a online retailer of handcrafted wooden goods, ranging from painted children's toys to ornate carved pipes to minimalist furniture. The scope of the project included logo design, brand identity and guidelines, and several applications of the brand including promotional materials and packaging. The final logo touches on the visual pun of eyes and knots in wood grain. The style is more geometric than some earlier iterations, with a singular sans serif typeface, Montserrat. The logo mark encompassed in a square allows for modular usage, and the allusion to wood grain opens the door for pairing with organic textures and patterns. Designer profiles and series numbers help showcase individuality. Simple, structured systems are versatile enough for every product. 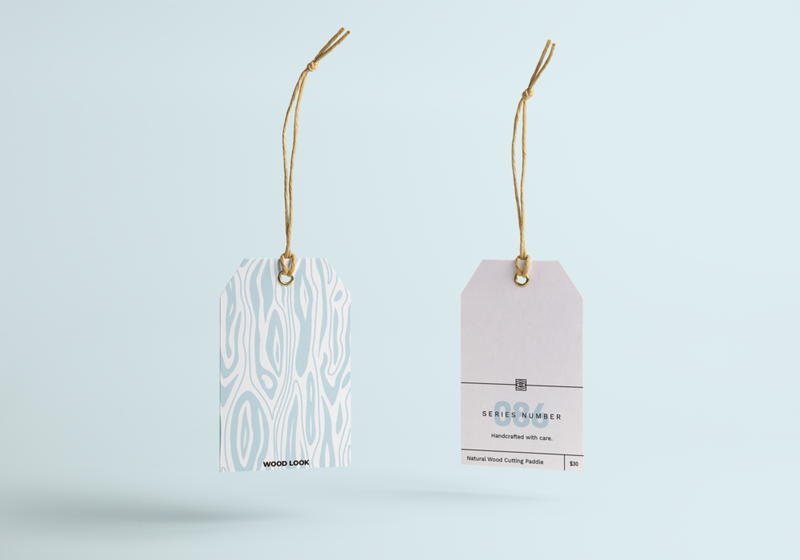 Product illustrations on shipping labels showcase the product. Including a slogan creates intrigue for new buyers.